We’d love your help. 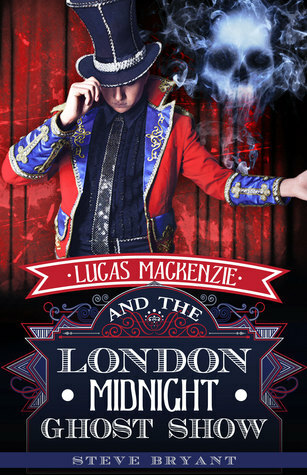 Let us know what’s wrong with this preview of Lucas Mackenzie and the London Midnight Ghost Show by Steve Bryant. Like the rest of Luca’s friends, he’ Lucas Mackenzie has got the best job of any 10 year old boy. He travels from city-to-city as part of the London Midnight Ghost Show, scaring unsuspecting show-goers year round. Performing comes naturally to Lucas and the rest of the troupe, who’ve been doing it for as long as Lucas can remember. To ask other readers questions about Lucas Mackenzie and the London Midnight Ghost Show, please sign up. I don't have a lot Ultimately, I don't have too much to say on this book. I was really excited when I got the chance to read it, because I love books that are given a circus-y setting. I don't know why I'm fascinated by it, but I'm the first to admit that I am. I was hoping that it would be something like the Cirque du Freak books, which is one of my favorite young adult series. Plus, I love the cover. And I should know by now that that is not the best way to judge. I got this for my honest review. I love the title and the cover. This book is probably like a middle grade young YA type book. I wouldn’t let me 8 year old read it yet only because of some of the talk about kissing in cars and the curves of the triplets and such as that but if he were to pick it up and read it I wouldn’t be opposed mostly because he watches the Marvel and DC movies which tend to be more risqué than talks of making out in the back seat of cars. The story was cute. A 10 year old lo I got this for my honest review. The story was cute. A 10 year old looking ghost boy who helped run the London Midnight Ghost show. He pretty much managed the acts of a ghostly magician, a beautiful 15 year old mystic. a talking and floating skull and A huge green man who passes as Frankensteins monster and quotes stuff from Shakespeare along with other famous authors and many other interesting characters. At one point Lucas decides to try and figure out where he is from and more about his family that he just started remembering. While touring he quests for this information about his family and the group had acquired the attention of a ghost hunter. So struggling with being in love with the 15 year old mystic yet not able to age past 10, stage managing the performers, and helping keep the Midnight Ghost Show in business. Lucas has some run ins with vampires, a ghostly postal master and goes on a quest to save Yorick. As well as try to find his family. All in all the story was fun and interesting. The characters were funny and I enjoyed the ending. Only gripe is it was set in like the 1950’s ish time frame. So, not sure if some young kids would be able to really understand who Shirley Temple is and what the Addams Family is. Plus some of the words and other character/ historical figures referenced are pretty old. First off, awesome cover! Hats off to the Month 9 Books crew that designed this one. Alluring, intriguing, colorful: everything I'd want in a book cover. It's the reason I wanted to read the book. That, and the great title. Who wouldn't want to read about a Midnight Ghost Show?? Lucas Mackenzie turns out to be a ten year old ghost who's touring 1950's America with a troupe of performing spirits. Lucas is a stage manager of sorts, managing the acts of a magician, a floating skull named Yorick, a b First off, awesome cover! Hats off to the Month 9 Books crew that designed this one. Alluring, intriguing, colorful: everything I'd want in a book cover. It's the reason I wanted to read the book. That, and the great title. Who wouldn't want to read about a Midnight Ghost Show?? Lucas Mackenzie turns out to be a ten year old ghost who's touring 1950's America with a troupe of performing spirits. Lucas is a stage manager of sorts, managing the acts of a magician, a floating skull named Yorick, a beautiful psychic named Columbine, and a host of other hilarious ghosties performing shows for the living. Unaware there's a notorious ghost hunter hot on their trail, Lucas frets about never growing up enough to date Columbine and how to find his family, which he thinks is still living in the Midwest, but he can never seem to contact on the phone. I enjoyed the concept of this book and the world the author created. There's a lot of 1920-1950's references I think it might be hard for younger readers to identify with, such as old Hollywood actors and actresses (Shirley Temple, Ingrid Bergman), old T.V. shows like the Addams Family, and historical figures like Charles Lindberg. None of that bothered me as a reader because I remember much of it, but younger readers may tire of it. I should point out the tone of the book is not as dark as the cover might suggest. I was expecting something more gloomy/creepy by the looks of it, but it's a rather humorous story with few horror aspects, which is firmly in the middle grade genre. It's a fun story with wonderful, unique characters. I give it four stars! I am going to start off with, of course, the amazing cover. Because I am a complete sucker for a great cover. It’s the first thing someone sees, and it PULLS a reader in. This one did just that. Great job Month9Books! This book, I really liked. It was a great middle school book, that in the future I will let my daughter read. ( It’s still a bit too early for her. ) Lucas has quite the job for his age, and that involves running into some unexpected creatures along the way. Ghosts, vampires, the ad I am going to start off with, of course, the amazing cover. Because I am a complete sucker for a great cover. It’s the first thing someone sees, and it PULLS a reader in. This one did just that. Great job Month9Books! This book, I really liked. It was a great middle school book, that in the future I will let my daughter read. ( It’s still a bit too early for her. ) Lucas has quite the job for his age, and that involves running into some unexpected creatures along the way. Ghosts, vampires, the adventure never ends for him. He goes on quite the quest to find his friend Yorick, and trying to find his family. He felt it was time for him to find out more about where he was from. A fantastic story of finding out who you are, and growing up.